Would You Drive a Wireless Electric Car? With battery technology improving every year and major tightening of fuel efficiency requirements on the horizon, the question isn’t whether major automakers will make electric vehicles a major focus, it’s when they will. Yet even as manufacturers thrust EVs and plug-in hybrids into the spotlight, consumers have good reason to be hesitant to go all electric. Until charging a car is as fast and easy as filling one with conventional fuel, EVs will be a hard sell for some. But what if there was a way to charge a vehicle’s battery without even pulling off the highway? Before most Americans associated the Tesla name with Elon Musk’s electric vehicles, they associated it with one of history’s great inventors, Nikola Tesla. Tesla invented such world-changing technologies as alternating current (AC), radio, and the electric motor. One of Tesla’s passion projects that (probably) never realized its full potential was wireless electricity. 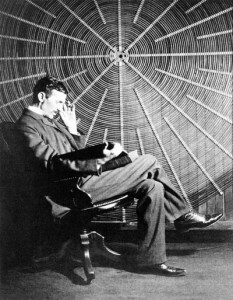 Tesla was able to transmit electricity some 200 feet without the use of wires. Although his dream of creating a grid of wireless electricity across the country never came to fruition, it does offer a fascinating potential solution to the major stopping point for American interest in electric vehicles like those bearing Tesla’s name. We’re curious: if electricity could be accessed as easily as cell service, would you be more inclined to buy an electric vehicle? Would you pay a monthly fee to access electricity on the go? The technology required to make this a reality is still strictly experimental, but if the direction the auto industry is going is any indication, one of the great ideas of the early 1900s could become one of the great breakthroughs of the 2000s.